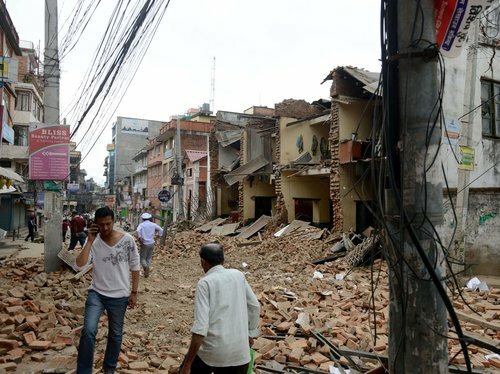 On April 25th, 2015 at 11:58 A.M, the capital city of Nepal, Kathmandu, was devastated by a 7.8 earthquake. Sadly, more than 2,430 people died in this city alone. Approximately 2,500 others living in India and China also perished from this massive shaking of the ground. The capital city of Nepal, Kathmandu, was named after the Kathmandap Temple. In Sanskrit, the word Kastha (काष्ठ) means “wood” and Mandap (/मण्डप) means “covered shelter.” Unfortunately, the city’s unique name wasn’t enough to safeguard a high wall monastery, a mud and brick cottage, various high-rise buildings, and many historic places of worship for Buddhists and Hindus living in the area from collapsing to pieces. The city has a rich and diverse history. It was an important trading center on the Silk Road that linked India, Tibet, and China together. It still remains an important trading center for agriculture, metal casting, and woodcarving. Not only is Kathmandu known for it’s enormous treasure house of art and sculpture, it is renown for its economic development. The Nepal Stock Exchange, The National Bank, and the Chamber of Commerce all reside here. There are more than 1 million people who live in this metropolitan area. The majority of them are part of the Newar tribe–indigenous people who love and care for others. Tourists noticed that it wasn’t the government or the police helping out the afflicted. It was ordinary citizens rescuing people from collapsing buildings, providing communal kitchens to feed the hungry, and aiding thousands through medical care. Psalm 10:17 says, “You, LORD, hear the desire of the afflicted; you encourage them, and you listen to their cry,” Please continue to pray for these precious people who lost their family, friends, and loved ones. Ask God to send volunteers around the world to help rescue the injured, serve meals to the displaced, and share the good new of Jesus Christ. May God also remind us to be thankful for all that He has given to us. In Jesus name. Amen. Previous Post Water: The Most Abundant Resource?